DIY natural skincare is growing in popularity because of how effective it is at improving the health of the skin. And while transitioning to using coconut oil for skin care is fairly easy to do, creating your own DIY facial serum recipe can be a bit more intimidating. So, to help you in your quest to create the perfect DIY facial serum, let’s explore why using a DIY facial serum just might prove to be amazing for your skin. Facial serums are lightweight moisturizers that contain a concentrated amount of nourishing ingredients. Typically, facial serums are a mixture of high quality oils and extracts that have antioxidant, anti-inflammatory, and hydrating properties. Facial serums are best applied to clean skin, and can be applied both in the morning and at night depending on your needs. When following a natural skincare routine, facial serum should be applied after cleaning your face with coconut oil or another oil, and after using a toner like an apple cider vinegar facial toner. While serums aren’t absolutely necessary for healthy skin, they are very helpful for improving lipid barrier function, decreasing dryness, and adding a bit of additional moisturizer to the face post-cleanse. Now, let’s find your perfect diy facial serum combination, shall we? 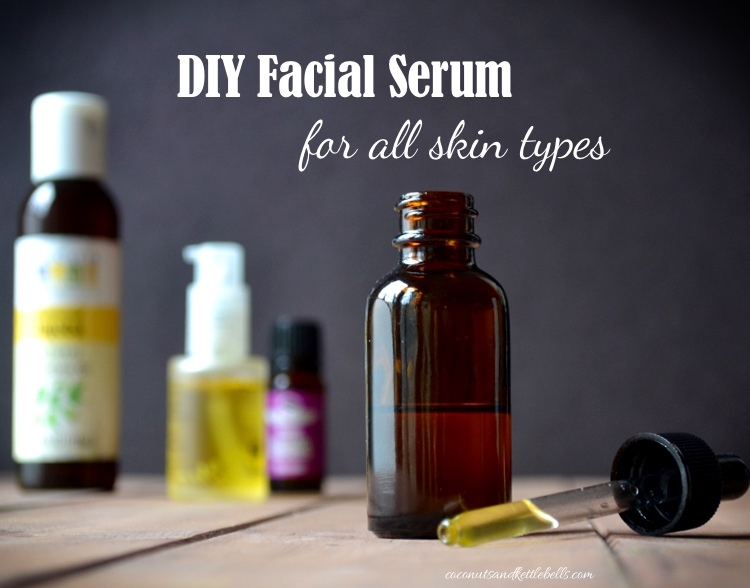 Below, I have listed a nourishing DIY facial serum recipe that is suitable for all skin types. In this recipe, jojoba oil is the base oil, and argan oil is the premium oil. Premium oils tend to be a bit more expensive because they have unique characteristics; however, because they are so nourishing, a little goes a long way. 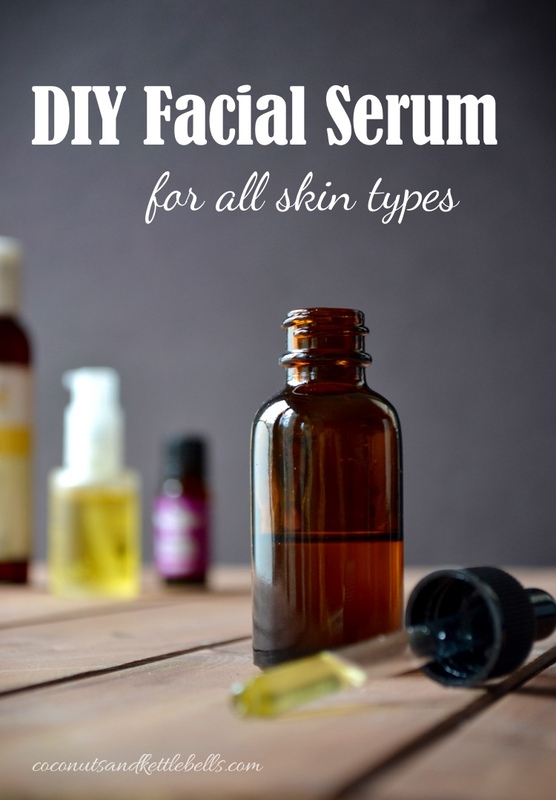 Under “other options,” I’ve listed additional DIY facial serum recipes you can try out based on whether your skin tends to be dry, oily, or normal. While the original recipe is a great place to start as it’s great for all skin types, there is always room to explore other options. No matter what your skin type is, it’s best to do a patch test on your skin to see how it reacts to a specific oil blend before applying it to your entire face. If you are allergic to a specific food ingredient like nuts, please do NOT apply it to your skin. And lastly, please be aware that essential oils should be used with care. Please educate yourself about an essential oil and its affects before applying it to your skin. Pour the base oil and premium oil into a 1 oz amber glass bottle using a small funnel. Add drops of essential oil. Close the bottle, and shake well to combine ingredients. Store in a cool, dark place away from sunlight. When applying to face, just a few drops will do the trick. Be sure to apply the DIY facial serum after cleaning and toning. After applying, allow 10-15 minutes for the DIY facial serum to fully absorb. Is it OK to use an oil-based facial serum if I have dry/oily skin? If your skin overproduces oil, applying nourishing oils can also help to exfoliate skin because it breaks up and dissolves excess oil without striping the skin of its natural lipid barrier. It also helps to restore lipid barrier function, which can help your skin regulate oil production. Got questions about this DIY facial serum? Want to share your favorite serum combinations? 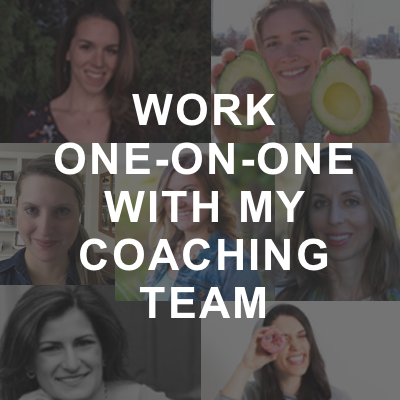 Share below—I’d love to hear about it! I found your website a month ago and I’m loving it. I have been been using the OCM since then. I have acne prone skin and for the first two weeks I saw big positive changes on my skin tone and the acne dissapeared. I used coconut oil and castor oil at first but then I added a few drops of tea trea oil due to my oily skin. After I added the tea tree oil I started to see acne and my skin is very dry now. What do you think i should do? I’m using now every night: 70% castor oil, 30% coconut oil and aloe vera leaf before bed every night. Am not using the tea trea oil anymore. Btw, I also have mild melasma on my chics. What do you think I should change to hydrate my skin without making my acne get worst? Hi Tania! I would DEFINITELY reduce the amount of castor oil you are using! I would recommend reversing the ratio to 70% coconut oil and 30% castor oil. Castor oil can be very drying. Try that and see what happens! Hi Noelle, can you apply foundation after using the OCM or will it slide off? Absolutely! It’s just like a regular moisturizer, so once it dries, you can do whatever you’d like – including makeup. 🙂 I would give it time to absorb, however! So I want to make this facial serum, but my skin is more like normal dry….what combination do you suggest I use in this case? Also, kind of on a related note, the coconut oil cleansing is working so well! I still get an occasional breakout, but there is such a high improvement in my face. Will my breakouts ever stop? i have very oily skin especially on my face. i have jojoba oil, coconut oil and Jamaican black castor oil, can i go ahead ahead and it? I have very dry skin around my nose but normal everywhere else. I have been using the Coconut oil wash for a month or so now and I still have some flaky skin around my nose any suggestions? Do you have a recipe for a facial serum that includes carrot seed or raspberry seed oil for SPF coverage? I feel I need to protect my face during the day! I do not, I’m sorry. If you find a good recipe – please let me know! I would recommend trying to wash your face with jojoba oil instead of coconut oil – and seeing if that helps. Hope that helps a bit! Please what natural moisturizer do you recommend for an oily skin after using ACV as my toner? I am 25 years old and have a wheatish complexion with combination skin. Could I also go with your basic recipe? What could I add to make my complexion brighter? Is mid twenties the right age to start using serums? Was wondering,do any of the essential oils need to be referigerated? And also, if I add lavender oil into my apple cider toner, can i still use this serum after? I have been using the coconut oil for cleasing. My skin gets really dry after. I put on cereve facial moisturizer after and it’s still seems dry on cheeks. I am considering using jojoba instead. Will you please let me know of a good brand for the oils. Also should it be a solid at roomy temp. I should moisturize after cleansing right? I tried without but got flaky skin. Hi there! Just click the link to jojoba oil above! That’s the brand I use and recommend. It’s a GREAT option for cleaning your face! I would suggest giving that a try now. Hope that helps! Hi! Can this serum be used on the eye area? Love your site? thanks so much! Hi Meg! It’s hard for me to give a definitive answer for this because there is no solid “yes” or “no” for what oils can and can’t be used for under the eye area. I can say that many people do use oils like coconut oil, almond oil, and jojoba oil under the eyes, and see improvements. I personally do use this serum underneath the eye—mostly just on the bony part of the lower eye. As always, be sure to avoid getting this into your eye, or rubbing this into the lower eyelid or just below it, as it can get into the eye that way. Hope that helps! Hi Noelle, I’ve started cleansing my face using jojoba oil because I have acne prone sensitive skin and it was working out pretty well with the apple cider toner. So i decided to add on the serum because my face felt a little bit dry after cleansing and toning. A few days later my face started to break out even more. Is this normal? I’ve already stopped using the serum because my face got worse. What can i do after cleansing and toning if my skin feels a little dry? Should I just leave it as it is and not use any moisturizer post cleansing and toning? Hi Lisa! I would actually try to use just a bit of jojoba oil when your face feels dry, since you know that oil works for you. Also, if you have another moisturizer that works for you, it might be best to let your face adapt to the cleaning + toning for at least 2-4 weeks, and then try adding in other things like a serum. Hope that helps! Re the recipe for the serum for oily skin, do you use the same ratios (base, premium, & essential oils) as you do for the serum for all skin types? Hi Lucy! No problem at all. Just leave out the essential oils. Hope that helps! HI! can I use this serum as a daily mosturizer? or you recomend not to apply this everyday? At what time of the day do you recommend to apply it? morning or night? or both? Hi Noelle! GREAT information on your site! I’m very excited to give this skin care approach a try. However, one key thing that’s in my standard face conditioner is a sunscreen. This is important to me, and I’d like to make sure my all-natural routine still protects me from the effects of the sun. Can you suggest how I can make this happen without using a chemical-filled moisturizer or cream? Hi Jess! Great question! I have some of the sunscreens I recommend over on my resources page underneath skin and body care. Hi there! You can. However, serums are typically for facial skin after cleansing. I would recommend using something like coconut oil or shea butter for a body moisturizer. Thank you so much. I will use Shea butter. Inwas wondering if you have a body moisturizing recipe, also what could help me with acne scars, ive been using a burts bees face soap with the toner and a natural clay mask a few times a week and my face has really improved, but im getting married in a few months and people have recommended a peeling but i just feel it could be too strong for my face, any suggestions! I followed the OCM and feeling great. I live in the bay area. Even if not directly out in the sun, I get enough sun exposure while driving/walking around. What should be steps to follow after OCM and toner before getting out of my house. Should I apply the serum followed by a store bought moisturizer that contains SPF. I am not a big fan of sunscreen and concerned that just OCM and toner might not protect my skin on hot days. Hi Machi! What do you typically do? If you usually apply a moisturizer with SPF, feel free to do so post-cleanse. I personally find I don’t need moisturizer after I do the OCM, so I don’t use moisturizer. But, that doesn’t mean it won’t work for you. If you’d like to apply sunscreen, I recommend using a simple mineral-based sunscreen on your face in the morning before you go outside if need be. Hi Tina! I recommend trying the original recipe for the serum. Give avocado or sweet almond oil a try for cleansing. I have EXTREMELY oily skin (like oily within the hour after washing). I am considering trying coconut oil as a face wash and following with ACV toner and a DIY facial serum as a moisturizer. I have read in the comments that some with oily skin still struggle with oil even when using the oily skin serum you recommend above. Would you mind recommending which formula I should use? I don’t have much acne (just now and then, maybe a spot or two), I just REALLY struggle to keep my face oil free. Thanks for your time! Hi Emily! I would recommend cleaning your face with coconut oil, doing the apple cider vinegar toner, and holding off on the DIY face serum all together. See how your skin does with just those changes. Then, if you feel your skin is a bit dry, I would recommend going with the recipe for the oily skin, as that’s going to be a good place to start. Hope that helps! I have very sensitive skin and quite bad acne rosacea across my cheeks and chin. I tend to find putting oil on my skin can aggravate the rosacea but am keen to try more natural skin care. Can you make a recommendation as to the best things to try first? Currently I use a cleansing water and rosex cream but keen to ditch the chemicals! Hi Anne! I would actually recommend using a gentle oil, like virgin coconut oil or jojoba oil using the oil cleansing method. You may find that this is the perfect solution for cleaning your face, and moisturizing it at the same time. Note: Because your skin is sensitive, you may need to be open to trying a few different oils until you find the one that works for your skin. Hope that helps! Just wondering how u got on with using acv and coconut oil on your rosacea? Is the any particular oils that work well with this condition? Hi Nabeelah! All the ratios and instructions are clearly listed in the recipe. With the alternative options, all you do is use the alternative oil options. Please read the post above to see this described. Hi Jenna! If you feel like it’s working well for your skin, then I would continue to use it. Personally, the natural oils I use keep my skin very supple and soft. The only product I use is Vitamin C-ex, which I consider to be anti-aging as it’s full of anti-oxidants. Primal Life Organics is high quality and slightly pricey, however I consider it worth it and always purchase during sales. 🙂 Hope that helps! Is the essential oils manditory? Hi Amber! No, they are optional. I have an oily skin, but it’s hard to find evening primrose oil here in my country. What oil(s) do you suggest to substitute it? 1. Is there a rule on how many oils you can blend together? 2. I tried making my own lotion (shea butter+ coconut oil + lavender + jojoba oil + geranium + vitamin E) but it’s so greasy, what should I do? 4. Is it not recommended to mix two carrier oil together? I’ve read about jojoba oil that it shouldn’t be used on face. Presumably it has similar size and structure to our own sebum and it tricks the skin cells to produce less sebum overtime, which is of course not good for the skin, you will lose more moisture and wrinkle more. I don’t know how true this is but I’d stay away from jojoba oil just in case… Just thought I’d share! Coconut oil is safe though. Hi Eru! I’m excited to tell you that this isn’t true, and jojoba oil is incredibly nourishing as a moisturizer for the face and skin—just like many other oils. There is no evidence whatsoever showing that using jojoba oil makes cells produce less sebum overtime, and in fact, jojoba oil has been found to benefit the skin in a number of different ways. It’s fantastic for all skin types as a serum, and can greatly improve the skin’s acid mantle. For more information on coconut oil’s uses for the skin (including when and when not to use it), check out this post. Oil cleansing method. See more here. Hi Noelle! I just discovered your site after a friend recommended I start cleansing with coconut oil. Thank you for all the info! I plan to start trying the OCM as well as using your DIY toner recipe and then after a couple of weeks, once I see how my skin reacts to that, potentially adding this serum. 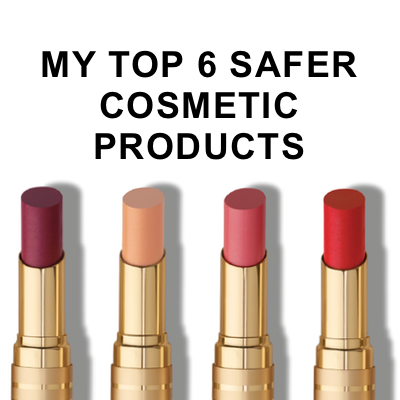 My skin is combo – oily T-zone, dry elsewhere. Do you recommend the original serum recipe with jojoba oil for this skin type? Also, I have hereditary dark circles under my eyes (and dark skin on my eyelids). Is there any natural product I can use to try to help with that? Hi Jennifer! I recommend using the original recipe first, seeing how your skin responds, and then going from there. Focus on just the OCM and finding the right oil for your skin first, and then see how your skin does with the serum. I don’t have a product for the dark circles, but I do think the OCM method and the ACV toner can absolutely help improve the tone/function of your skin. Hope that helps! Blessings Noelle! 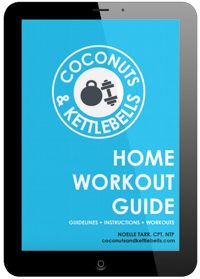 Found your site a few weeks ago and using the coconut oil cleanse and vinegar toner! I’ve always had oily skin and using oil to clean just didn’t seem logical, but now I’m a believer! I’m 54 and going through menopause with hormonal breakouts along the jaw line/upper neck. I’m hopeful this regimen will clear this up! Thank you so much for all the helpful information! You are so welcome! Thank you for sharing that. So glad it’s helped! I have started the OCM in the evening followed by the toner however since you suggest only doing the OCM once a day what can I put on my face in the morning if my skin feels dry? Thanks for the great information! I will definitely try that, thanks! Do you think I could replace the jojoba oil with Grapeseed oil? Hi noelle! Where can I find amber containers for this serum? Can i use the regular white/clear plastic ones? On a side note, the coconut oil facial wash and acv toner is working great on my skin! Almost immediate results and it hasent even been a week! Hi Noelle! Does it need to be an amber bottle? Can I use a plastic bottle instead? I recommend the amber bottle because it will ensure the oils are not exposed to light, which can eventually degrade the oil quality and change the structure. Can I replace jojoba oil with almond oil? Can I add some tea tree oil and also lavender oil together? I have extremely sensitive skin to the point where I pretty much break out/react from every product I’ve used plus I have extremely dry itchy skin on my face, neck and most of my body. I need a good moisturizer along with a recipe for washing my face and effectively removing makeup. Thank you! Trying this coconut washing method and so far I am loving it…… My question is.. Do you ever feel like you need to exfoliate using this method?! If so what do you use? I assume you would exfoliate first then wash then tone then serum. One more question. If the time comes that I feel I need an additional moisturizer over the serum…. Is there one you recommend? I know more moisture founds like a lot but my skin seems really dry. I like coconut and jojoba but aloe Vera does not work on my skin! Can you recommend a home made moisturizer without aloe in it? I don’t know of any personally. 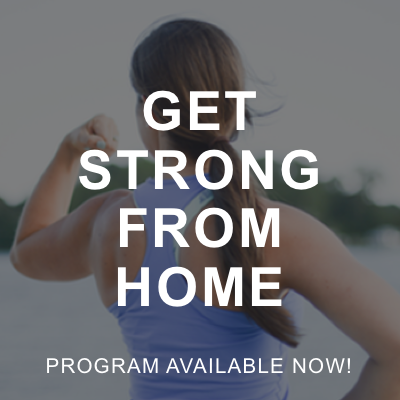 You can search wellnessmama.com—she has some great recipes! You’ve said that these facial serums should only be used after cleansing and toning… but what if in the morning I just rinse my face with water and use the ACV toner? Could I use a facial serum to moisturize, even though I haven’t cleansed? I’ve recently started using the OCM + ACV toner and am loving it! Thank you so much for all of your insight!! And patience! You absolutely could do that! I consider a morning face splashed with water and toner a “clean” face. So glad it’s worked out for you! From past 8-10 months, I am seeing red bumps on my face that are little itchy and also I see that my skin flaking a lot which I assume is because of dryness. What routine can I add in the morning and in the night to take care of this problem. 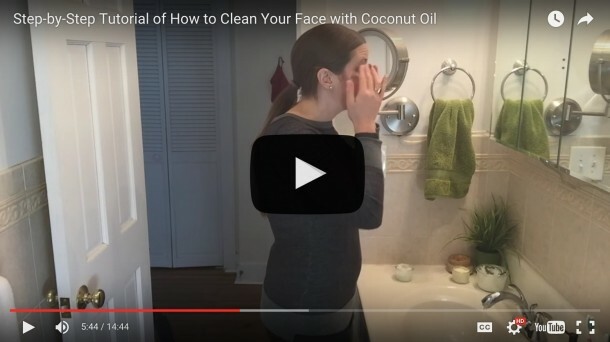 I recommend reading over my post: How to clean your face with coconut oil. Good luck! Can you substitute the jojoba oil with almond oil in the “normal” serum? Chanced upon ur website and im loving it. For the moisturiser can i use jojoba oila nd rose hip seed oil? I tried the acv toner tonight and hopefully my sensitive skin would suit this blend. Yep! Just follow recommendations above!